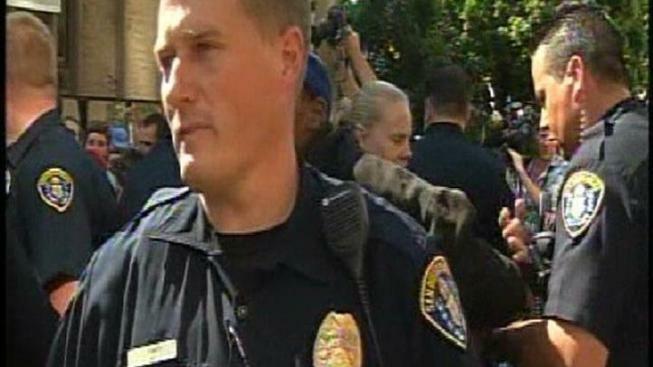 Two demonstrators at the weeklong Occupy San Diego protest were arrested Friday at the San Diego Civic Center Plaza. At about noon Friday, officers began moving protesters out of the Plaza as well and protesters resisted. Five protesters were pepper sprayed and an additional protester was arrested. San Diego police officers held true to their warning and forcibly removed tents that had not been removed by the midnight deadline. At about 7:30 a.m. Friday, they arrested one man, said SDPD Chief William Lansdowne. 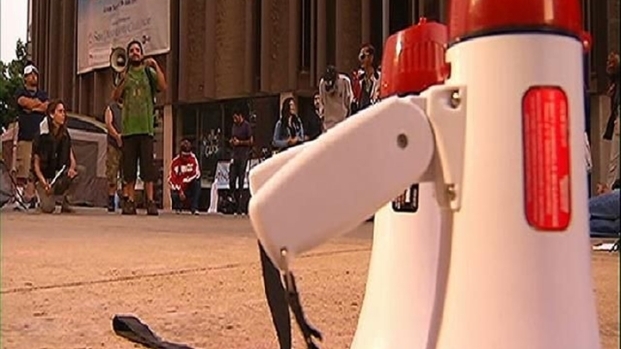 Officers had released a warning to Occupy SD organizers Thursday afternoon. After the midnight deadline, police extended the warning until 7 a.m. Friday. Any tents left on the property would be removed and those who resisted would be arrested. Lansdowne said the man arrested will likely be cited and released Friday afternoon. The last tent was removed at noon but a group of occupiers remained in the Plaza. More officers arrived on motorcycles and stood in a line near protesters. A portion of the Plaza was closed off with a chain-link fence, and city employees were cleaning it with a hose and brooms. 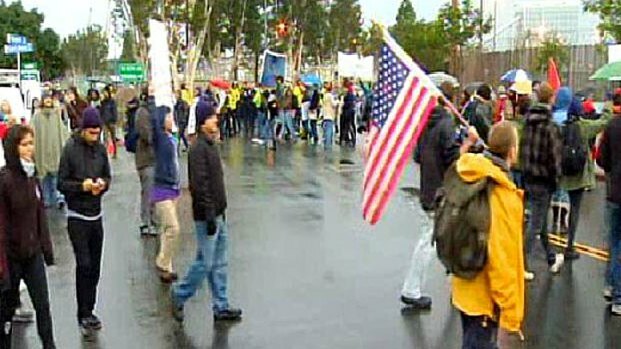 San Diego police put the Occupy SD protesters on notice - pack up and move or you will be removed. The space outside the Civic Center has been reserved for another event this weekend. Nicole Gonzales reports. After tents were impounded, protestors yelled at police, "Thank you for stealing our home!" "I understand that they have a right to protest," Lansdowne said, "and I think they understand that we have a responsibility to do our job too." He commented on the peaceful nature of the Occupy San Diego demonstration, comparing it to protests of the past. "I was part of the free speech movement in Berkeley in the late 60s," he said. "The way we handled this is 180 degrees different from the way that we handled it 40 years ago." Just before 7 a.m., six tents remained in the Plaza in a tight circle. About 100 protesters said they did not plan on removing their tents, and were planning on taking a stand against police demands. Police then proceeded to take down the tents and impound them. The protesters began occupying the Plaza Saturday as part of a nation-wide movement against corporate greed and income disparity. By Thursday, a tent city of at least 100 tents had been built and the city fire marshal told organizers no more tents would be allowed. Assistant Chief Boyd Long held an open dialogue with the protestors at about 4:40 p.m. Thursday. He told protesters they had to remove their tents and property and cannot bring them back. “It is unlawful for any person to erect, place, allow to remain, construct, establish, plant or maintain any vegetation or object on any public street, alley, sidewalk, highway, or other public property or public right-of-way, except as otherwise provided by the Code,” the notice read. The number of protesters in Civic Center dwindled significantly Friday morning. Groups have moved to alternate occupations in Balboa Park and near the USS Midway Museum.